Eastgate occupies the site of the original entrance to the Roman fortress of Deva Victrix. The original Roman gate, or 'Porta Principia Sinistra', was surmounted by a wooden tower, a stone replacement was constructed in the second century A.D., and this was replaced, most probably in the fourteenth century. The present gateway dates to 1768 and is a three-arched red sandstone structure which carries the walkway forming part of Chester city walls over the street. On the inner keystone are the arms of the county palatine, a sword of justice and three sheaves, The outer keystone bears the arms and motto of Richard Grosvenor. In 1899, to celebrate the diamond jubilee of Queen Victoria two years previously, an elaborate clock was added to the top of the gateway. It is carried on openwork iron pylons, has a clock face on all four sides, and a copper ogee cupola. 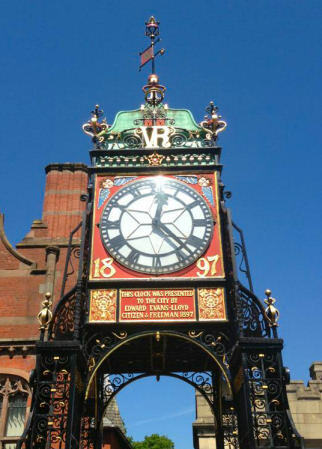 The clock was made to the design of architect John Douglas, a native of Chester, the wrought iron was the work of his cousin, James Swindley of Handbridge. The clock was formally unveiled on 27 May 1899, the 80th birthday of Queen Victoria. The clock required weekly winding until 1992, when the original wind-up mechanism was replaced by an electric one, to reduce maintenance costs. The Eastgate clock and gateway, a grade I listed building, is a prominent and well known landmark in the city of Chester and is said to be the most photographed clock in England after Big Ben. 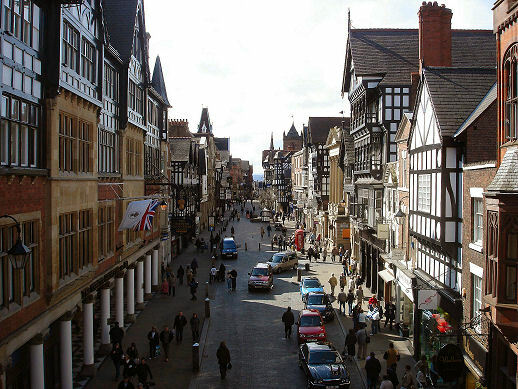 Chester was founded as a Roman fortress and town, known as Deva Victrix in about AD 74 or 75. The fortress took the form of a rectangle with rounded corners, with a gate at each side, the eastern gate has survived to the present as Eastgate. In around 100 A.D. the fort's defences were reinforced by a sandstone wall and at this time the gates and their towers were also rebuilt in stone. The Roman Eastgate had two arches with a statue of the god Mars at the centre. A model of which may be seen in the Grosvenor Museum. 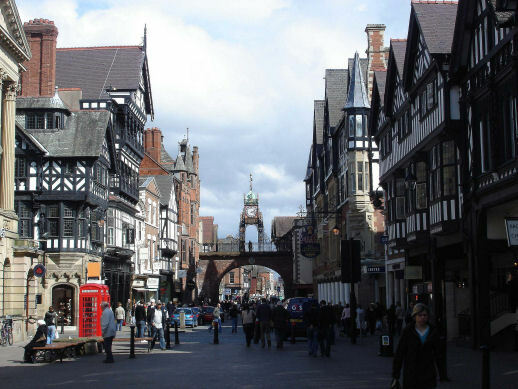 In 907 the Saxon kings of Wessex refounded Chester as a burh. At which time the Roman Eastgate was probably still in existence. The Roman Eastgate was replaced at an unknown date in medieval times, possibly to a design influenced by Caernarvon Castle. It consisted of a tall rectangular shaped tower with octagonal corner turrets with lower towers octagonal turreted towers to the sides.A portion of the medieval northern flanking turret was uncovered during excavations in 1971, which consisted of cream-coloured sandstone. By the onset of the eighteenth century the city walls were no longer required for their original defensive purposes and were converted into walkways. The medieval gateways, which by that time were becoming an obstruction to the traffic into the city and were replaced by wider arched gateways.